Easy, fast, gentle, petroleum jelly! Use q-tip to gently wipe away eye makeup. It works, and it's cheap! A box of Q-tips and a little tub of Vaseline will cost around $6. You'll run out of Q-tips long before the Vaseline is gone. It seems to last forever! I've been using the same small tub for about 6 months now, and it's only halfway empty. Of course, you can use off-brand products for this. First, wash your face as usual. Just don't worry too much about cleaning off your eye makeup. I usually swipe over my eyes gently with my facial cleanser, just to remove my mascara and some of the other eye makeup. Dip the Q-tip into the Vaseline and get about a pea-sized dollop. Then, using the inside corner of the Vaseline's lid, roll the tip in the jelly, going only in one direction. This will make sure the cotton is compacted and won't fuzz up and stick to your face. It will also completely coat the end of the Q-tip with a very thin layer of Vaseline. You do NOT want a lot of Vaseline on the Q-tip, or this will get very goopy, very quickly. You shouldn't be able to see any Vaseline actually on the Q-tip, it should just look like a very compacted Q-tip end. 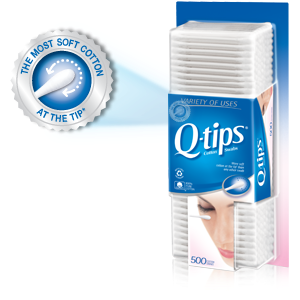 Gently wipe the Q-tip over the lid, turning the Q-tip a little after each pass to get a clean spot to wipe with. You do not have to press hard! The Vaseline will lift off the makeup with very little pressure. Continue until the Q-tip end is covered in makeup, then use the other end of the Q-tip (roll it in the Vaseline, there should still be plenty in the lid corner that you used earlier) and keep going until no more makeup shows on the Q-tip. You may be surprised that your eye looks clean a while before the Q-tip stops showing makeup being removed. Take care to not get the jelly in your eye (I don't use this on the waterline, for instance). After you are done cleaning, you can gently wipe your eyes with clean fingertips to lift off any excess Vaseline. There shouldn't be much extra Vaseline on there! After that, I like to apply a little bit of eye cream to help ward off wrinkles. 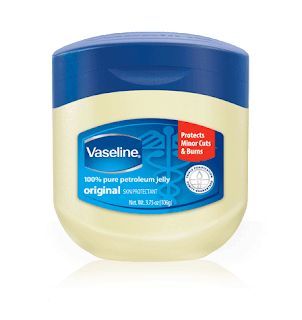 The Vaseline leaves my skin feeling very soft, and it looks very hydrated. After that, I apply the rest of my facial moisturizer.